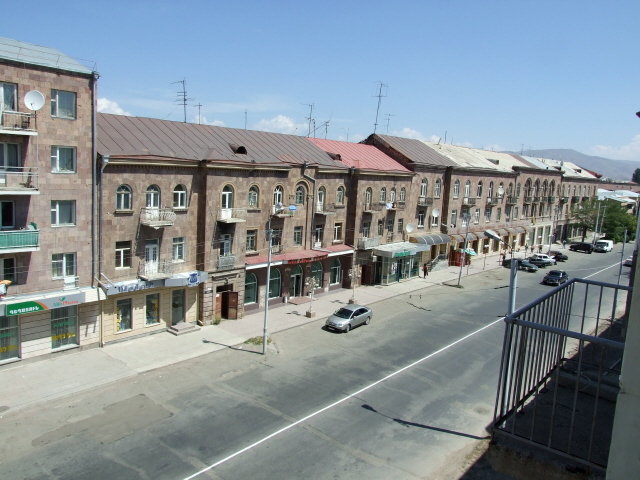 Gyumri is the second largest city in Armenia (after Yerevan) and functions as the capital of the remote Shirak region in the north-west of the country. 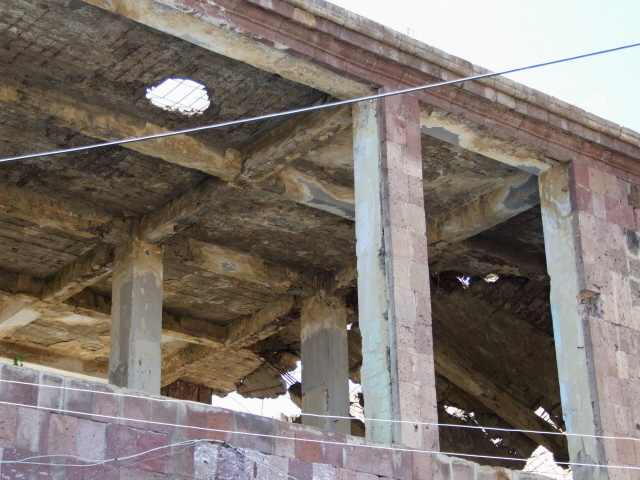 In the devastating Spitak earthquake of 1988 Gyumri was badly damaged, and you can still see various ruins today. There are a couple of further dark attractions within the city, and it also serves as a perfect base for excursions to various sites in the surrounding area. More background info: Gyumri was an old but comparatively insignificant city in Armenia until Tsarist Russia took over. They also changed the name of the place to Alexandropol. During that period it became one of the most significant trading posts and grew to be the third-largest city in the Caucasus, after Tbilisi and Baku, but ahead of Yerevan. The characteristic architecture of around the turn of the century is still the most visible legacy of Tsarist Russia in Gyumri (cf. also Kars in Turkey!) – it's referred to as Alexandropol's Belle Epoche. 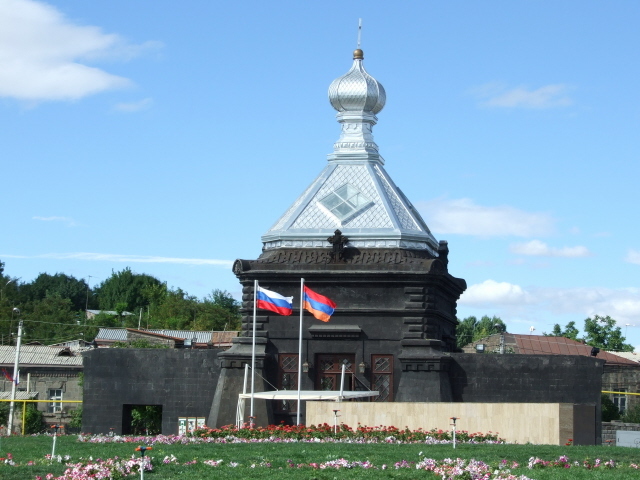 Russia has since then also always had a strong military presence in Gyumri, except for a short period following the Russian Revolution and WWI. 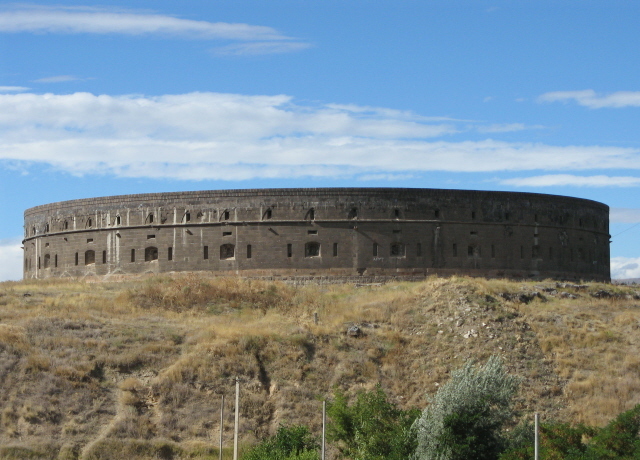 Some of Gyumri's military forts date back to the Tsarist period too (including the Black Sentry Fort). Even after the collapse of the Soviet Union, independent Armenia signed an agreement that allows Russia's 102nd military base to be based at Gyumri, with thousands of soldiers and substantial hardware (the same agreement also saw to it that Russian border guards still patrol Armenia's borders with Iran and Turkey – see Ani viewpoint & Iron Curtain). 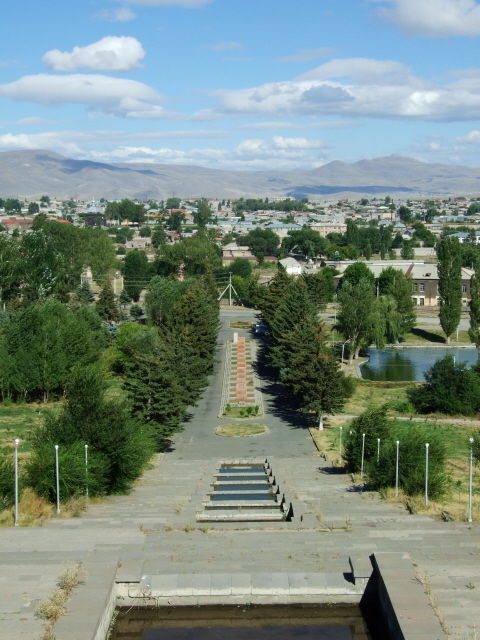 Towards the end of World War One, Gyumri/Alexandropol was occupied by Ottoman Turkey until after the signing of the peace accord in 1920 between Turkey and the short-lived then Democratic Republic of Armenia, which was accordingly named after the city: the Treaty of Alexandropol. It was this treaty that ultimately prevented the Turks' advance on Yerevan (but see also Sardarapat). Shortly after Armenia became part of the Soviet Union, the city's name was changed again in 1924, in honour of the revolution's leader Lenin, and was thus known as Leninakan until 1990, when Armenia reverted to the name of Gyumri (in a time when the Soviet Union was already heading towards collapse and Armenia's push towards independence strengthened). 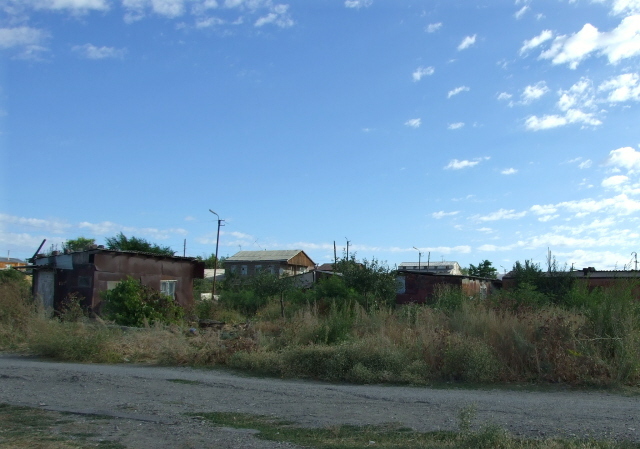 The Spitak earthquake of 7 December 1988 had its most devastating effect in Leninakan/Gyumri – and thus it is sometimes also called the Leninakan earthquake. The largest proportion of the overall death toll of between 25,000 and 50,000 was in Gyumri. The main reason that the quake claimed so many lives here was the poor quality of the apartment blocks in which so many inhabitants were buried. It was dubious from the start to even envisage the building of tall blocks of flats in such an earthquake-prone part of the world. 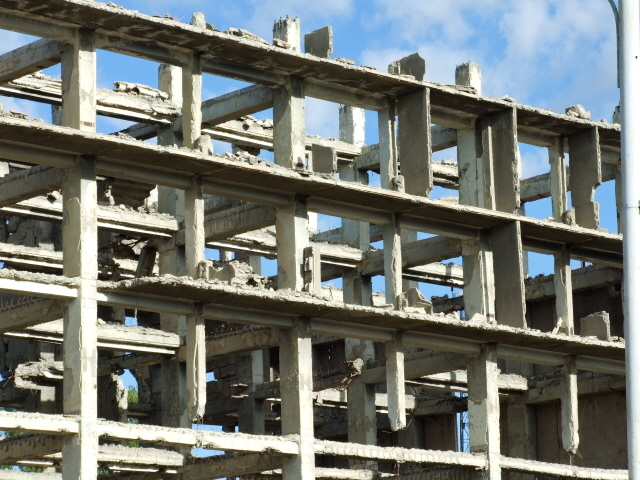 The cheap design and low quality of the concrete and other building materials used only exacerbated matters. People on higher floors had little chance of survival as their homes collapsed around them like houses of cards. Older buildings were damaged too, but it was those newer apartment blocks that suffered the most. My guide estimated it thus: of the Tsarist Russian-era buildings, only about 10% were destroyed, whereas out of those from the Stalin era about half collapsed; but the houses from the Brezhnev era were wiped out 100%. Although relief workers managed to pull thousands of victims out of the rubble alive, even more were found dead and coffins were piled high in the streets for weeks on end. A whole new cemetery was set up to the north of the city for all those earthquake victims. The despair of the survivors was terrible too – first there was the immediate shock of the quake's destruction. Then came the desperate rescue efforts, so hampered by a lack of heavy machinery for the task, so people were often forced to dig with their bare hands. Furthermore, the city's medical services were badly stricken, and there was no electricity and running water. Even emergency tents to house the hundreds of thousands made homeless by the disaster were in too short supply, and for several nights survivors had to camp out in the open, huddled around bonfires in the cold December nights. I vividly remember the heart-wrenching stories my guide (see below) had to tell of his experiences of the disaster, like the desperate feeling of helplessness when faced with screams coming from inside the piles of rubble of collapsed buildings and being unable to get to them. He had been extremely lucky to survive in the first place. Normally he should have been at his workplace, on the fifth floor of a building which was completely levelled by the quake – only minutes before the quake he had popped out to speak to a colleague he had spotted on a street corner outside the building. Most of Gyumri's extensive industrial plants that ringed the city were destroyed too. Today you can still see derelict industrial areas in different stages of ruin. However, life has returned after so many survivors were at first evacuated or left for good themselves. The population is still lower than it was before 1988 (peaking around 230,000), but has crept back up to ca. 150,000 to 170,000, as business too has come back to life. 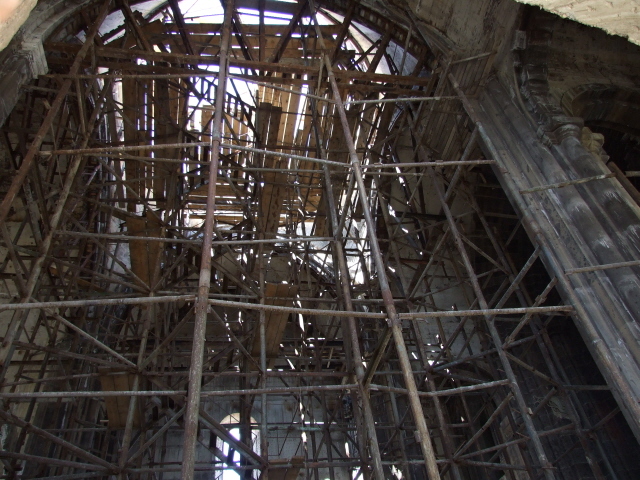 To this day, much reconstruction is still going on, including most visibly the large All Saviours Cathedral in the city centre, one of only very few large Armenian churches – in this case a design based on the great cathedral of Ani. New blocks of flats have mushroomed on the outskirts of the city to replace all those destroyed in the quake. And you have to wonder whether this time at least the quality of the construction was better … as one thing is certain: the 1988 earthquake will not have been the last one to hit this region!. Some 4000 people still live in "temporary" housing, portacabins and containers, set up in the emergency of the immediate post-earthquake days. 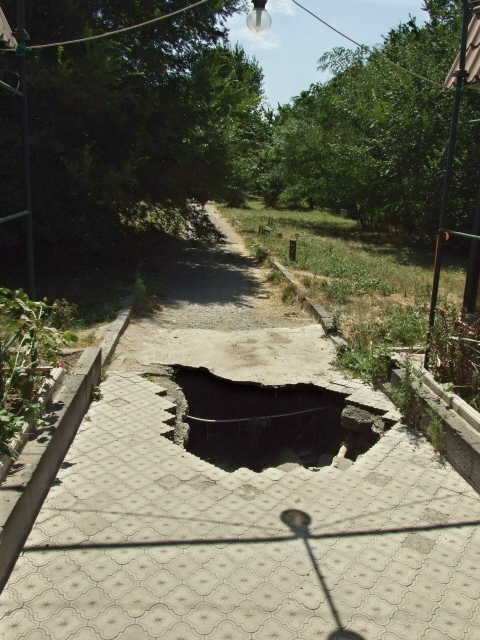 What there is to see: Apart from being a base for excursions (see combinations), the main thing that will interest a dark tourist in Gyumri itself is likely to be the remaining traces of the earthquake damage of 1988. And there is indeed still plenty of it to see, even almost a quarter of a century later. The one building that stands out most in this respect is the huge All Saviours Cathedral in the very heart of the city, located south of the main square by the city hall. It was badly damaged during the 1988 earthquake, the central dome and most of the roof collapsed, leaving only about a quarter of the whole edifice still standing. Reconstruction work is progressing slowly. Much of the outer walls have been rebuilt, but the inside is still a maze of scaffolding and the central dome is still missing. Outside there are piles of original stones awaiting re-incorporation into the restored cathedral. On the square south of All Saviours are a few memorial plaques as well as a tall monument dedicated to the "innocent victims". In a way this begs the question: were there any guilty ones? … well, maybe those planners, architects and builders responsible for the poor quality apartment blocks that so easily collapsed in the quake. Several other buildings in the old town streets are still empty shells, with roofs missing and some collapsed walls, though the facades are in general still largely intact. Just walk the grid of streets in the old centre (known as Kumayri) and you'll spot them in between the more or less preserved Russian architecture and intriguing Art Nouveau details. One of the largest, most stately, ruined buildings is to be found at the end of Gayi Poghots, one street south of parallel Gorki Poghots, right opposite the northern end of the City Park. Nearby you can also see what remains of Gyumri's post-earthquake "temporary" housing (containers, caravans, etc.) in which ca. 4000 residents still live today. 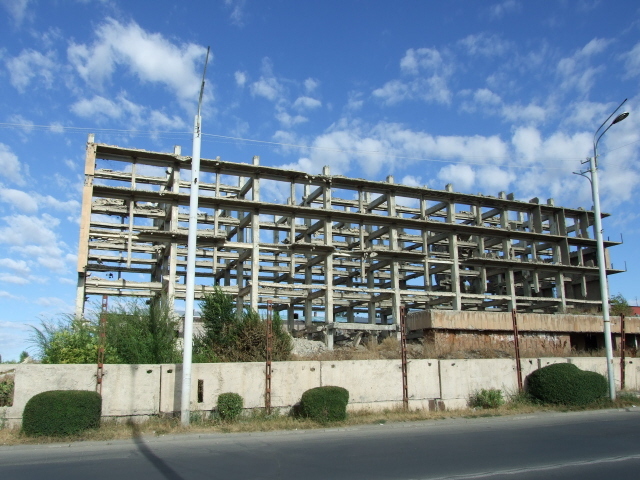 Much of Gyumri's industry was also badly damaged in the quake, and there are still a lot of industrial buildings in various stages of ruin all around the city. But these are naturally not so easy to explore, though you may catch a glimpse of these too en route out of town on excursions to other parts of the region. 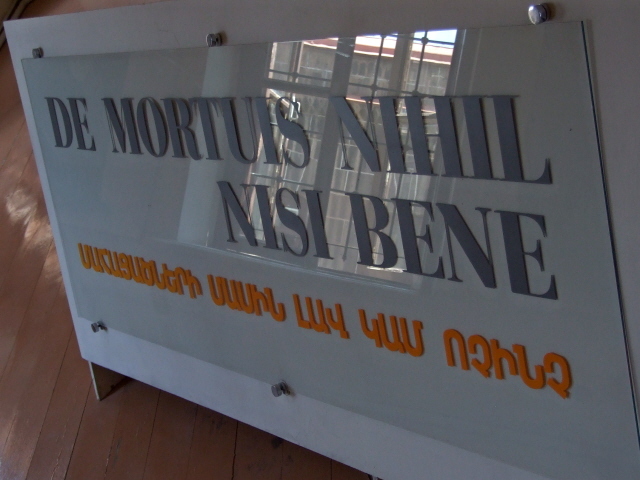 A "proper" visitor attraction in Gyumri is its Museum of National Architecture and Urban Life (Tuesday to Sunday 10 a.m. to 5 p.m., 1000AMD). For the dark tourist there is little of particular interest inside. It mostly contains old furniture, garments, rugs, household objects, musical instruments and the like. 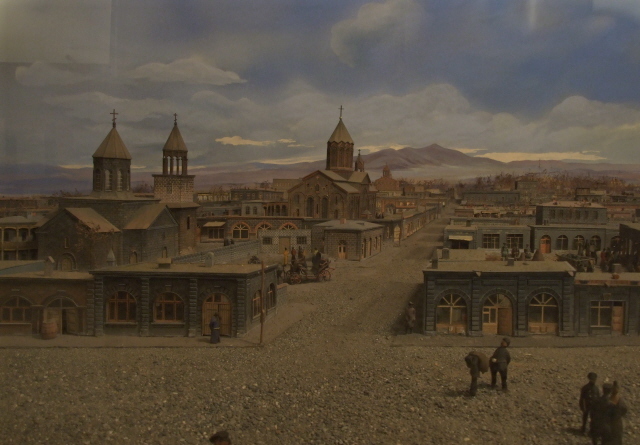 But the diorama model showing old Gyumri before its destruction is a possible exception. 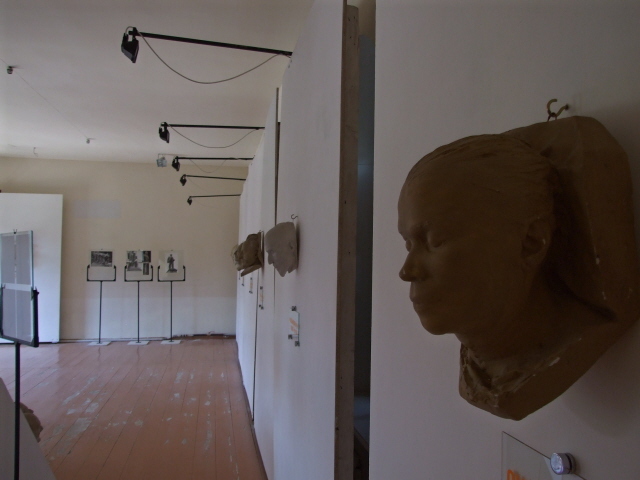 Much more interesting to the dark tourist should be next door, and is accessible via the museum – a warden will take you there and open the door for you: it is a kind of gallery where you can see an exhibition of (mostly) death masks! 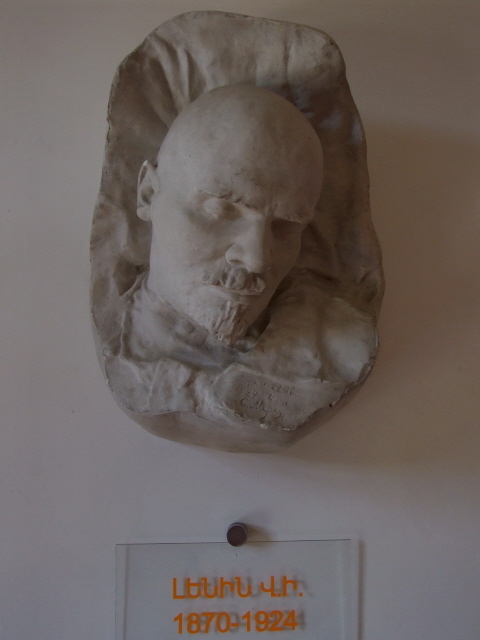 And this includes the only "surviving" original death mask of Lenin! As a photo indicates it was made by the same sculptor, Sergei Merkurov, who also made the Lenin statue that used to stand on Ankakhutyan Square, the pedestal of which is now occupied by a female statue, who my guide thus jokingly referred to "Mrs Lenin". 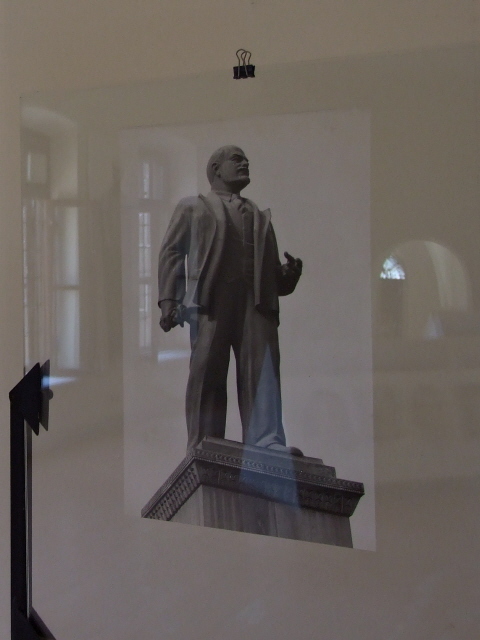 The socialist realist sculptures by Merkurov of Stalin and yet more of Lenin that were promised in the Lonely Planet guidebook, on the other hand, were nowhere to be seen. 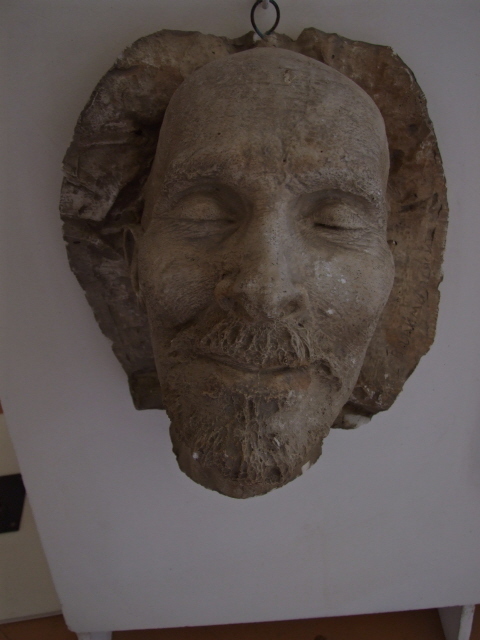 Still, the death masks do make a haunting impression. 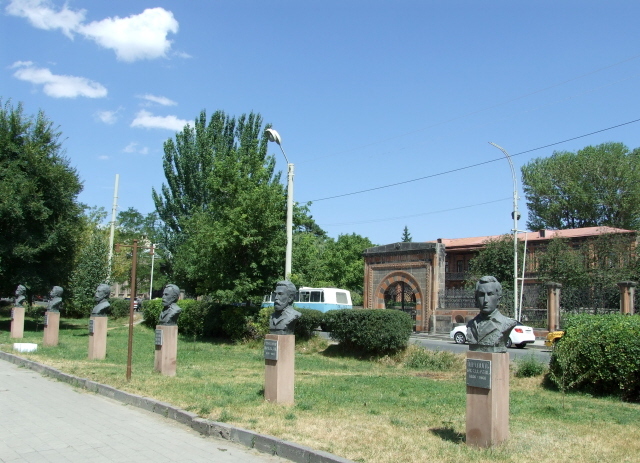 In the park outside the museum stands a row of busts who all look stoically forward – apparently it's a selection of local revolutionaries ... not that you'd be likely to ever have heard of any of them, unless you're an expert in local history. Just south of the central park to the south-west of the city centre stands a little Russian chapel, which looked well maintained, and indeed freshly spruced up, when I visited Gyumri in August 2010. As it happened, Russia's then president Dmitry Medvedev had just paid Gyumri a visit only the day before ... also visiting the troops in the Russian Army's garrison in their extensive Gyumri barracks complexes. 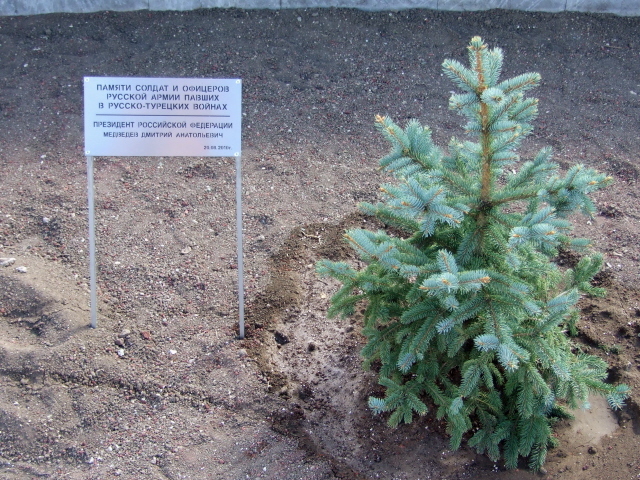 Part of his visit's protocol must have been the ceremonial planting of a tree next to the Russian chapel – as evidenced by a small fir tree with a little metal plaque next to it marking the occasion. 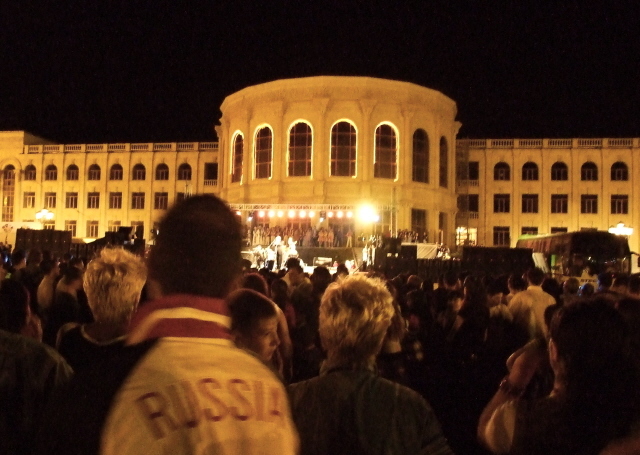 Armenian-Russian friendship was also celebrated by means of a free concert on Gyumri's central square that I had stumbled into the evening before. Mostly Russian musicians performed mostly Russian classics, although there was also a troupe of dancers from Karabakh. It was a cool atmosphere, but I also felt quite alien. My wife and I were eyed with much curiosity by the city's youth – some of whom, however, plucked up the courage to test their school English by asking us where we were from. My wife, who speaks Russian, had overheard them as they agonized over whether or not to ask. It was quite endearing. The Russian presence in Gyumri can also be felt at the city's highly reputed fish restaurant, supplied by its own fish ponds between the open-air seating – so you are guaranteed absolutely fresh produce here. The place also appears to be a favourite with the Russians from the garrison right next door. The restaurant, aptly named Cherkezi Zor (Fish Farm), is a bit out of the centre in a hollow by the so-called Red Fort west of Shirakatsi Poghots. 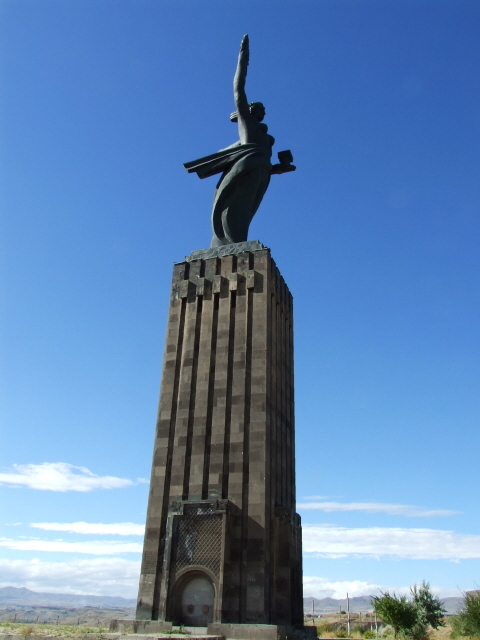 On the outskirts south-west of Gyumri proper stands the city's own Mother Armenia (Mayr Hayastan) statue on a hill – another fantastically oversized socialist-realist sculpture, though not as grim and martial looking as the Mother Armenia in Yerevan. Her Gyumri sister doesn't wield a sword, for instance. On an adjacent hill sits the squat round shape of the so-called Black Sentry Fort (Sev Ghul), which was also built by the Russian military, but back in the 1830s. It is now empty and derelict but still a nicely grim-looking edifice. 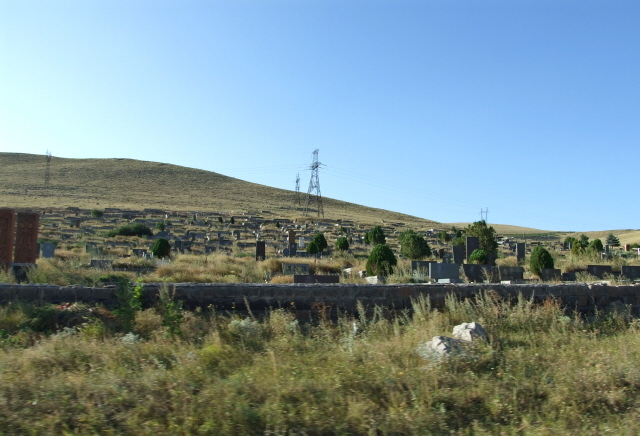 Finally, further out still, to the north of the city, by the M7 road leading towards Spitak and Vanadzor, a vast cemetery for the earthquake victims of Gyumri can be seen (it's about 6 miles / 10 km from the city centre). On balance, Gyumri makes a superb stop-over for a few days for those dark tourists who like getting a bit off the well-trodden track. It's far from touristy, and that in itself is an attraction. Plus it offers some interesting sights, and makes a perfect base for explorations in north-western Armenia (see combinations). 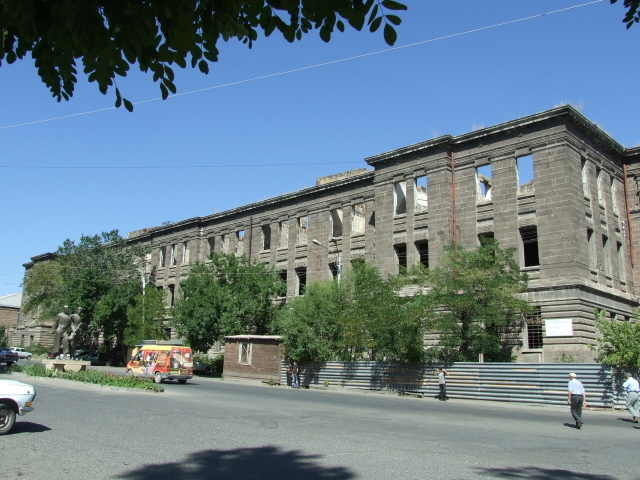 For guided tours around the region, which can be tailored to suit a more dark-tourism-oriented taste, I can recommend Shirak Tours based in Gyumri's Berlin Hotel – see below. Location: In the heart of Armenia's north-western Shirak province, about 60 miles (95 km) from Yerevan and ca. 35 miles (50 km) west of Vanadzor. Access and costs: quite easy to get to; noticeably cheaper than Yerevan. Details: To get to Gyumri is quite easy: it is on the one main railway line in Armenia between Yerevan and Tbilisi in Georgia, and is also served by countless bus and marshrutka connections from/to Yerevan and/or Vanadzor. Fares are cheap. The drive by car from Yerevan takes about an hour and a half. Gyumri also has the only airport other than Yerevan's that you can fly to from abroad, though connections are few and currently it seems to Russia only. However, should you happen to travel from/to Moscow to Gyumri's Shirak airport you can allegedly save ca. 20% of the cost you'd pay flying into/from Yerevan. Taxis from/to the airport are very cheap – and a couple of Gyumri's hotels also offer pick-up/transfer service. Getting around within Gyumri is easy enough on foot at least in the city centre but may require a couple of taxi rides to get to the more outlying sites such as the Mother Armenia statue and the Black Fort. Accommodation options are naturally less plentiful than in Yerevan, but there are a few very decent places that also won't cost you anywhere near as much as in the capital. 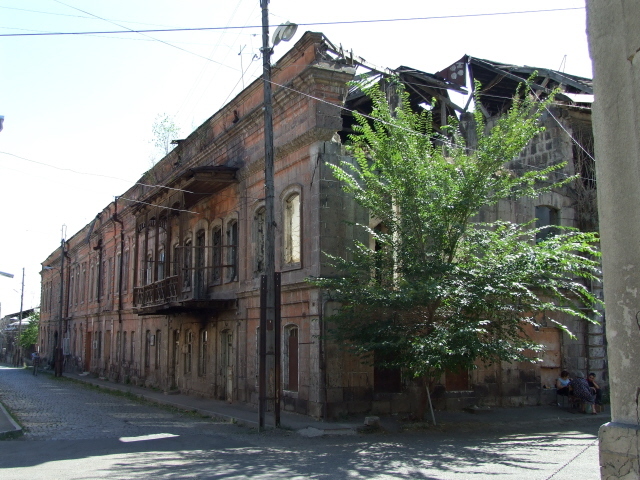 Yerevan's Villa Delenda now has a counterpart in the old historic part of Gyumri. 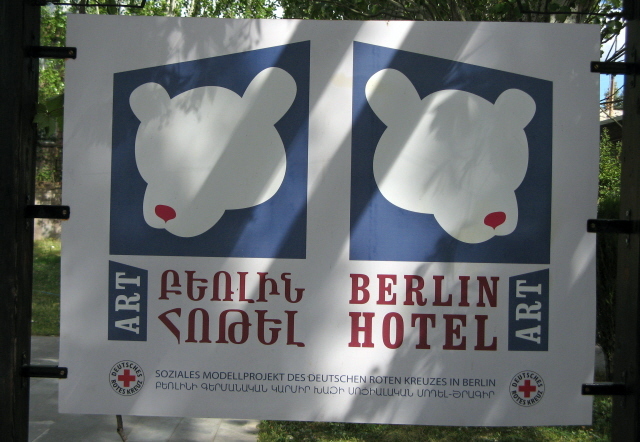 But the best place for dark tourists is probably the Berlin Hotel, also called "Gästehaus Berlin", as it started life as a place housing visitors to Gyumri's Red Cross sponsored hospital (namely by the Berlin branch of the Red Cross in Germany – hence its German name) which was set up in the wake of the 1988 earthquake disaster. The Berlin Hotel is home to Shirak Tours, who I can only recommend most warmly – see the sponsored page here. On the food & drink front, Gyumri can't quite compete with Yerevan for choice, of course, but there are a few good options. Vegetarians will be thankful for the option of getting very decent Georgian food, including baked mushroom dishes and khachapuri, at the Vanatur restaurant. (This nominally also functions as a hotel – but is not recommended because the restaurant downstairs regularly hosts very noisy parties, so you won't get any sleep unless you wear earplugs; and the hotel had also "lost" my reservation and only after a bit of confused negotiations in Russian, which my Russian-speaking wife thankfully took over, a room was hastily prepared – which looked nice enough but was only semi-functional). The most highly regarded restaurant in Gyumri is the local fish restaurant with its own fish farm – al fresco diners can sit right by the pools where their fish came from while watching its cousins splash about. The best bit in my view, however, was the bread, freshly baked in a tandoor-like earth oven under the eyes of guests. There is one very atmospheric beer pub, the Poloz Mukuch Tavern, named after one of Gyumri's apparently legendary humorists, on Jivani Poghots, right opposite the old brewery. Less characterful eateries can be found all over the city, including a couple on the western side of the main square. Time required: Gyumri itself can be "done" in as little as a day, but it's worth staying at least another two nights and using the city as a base for excursions in the area. 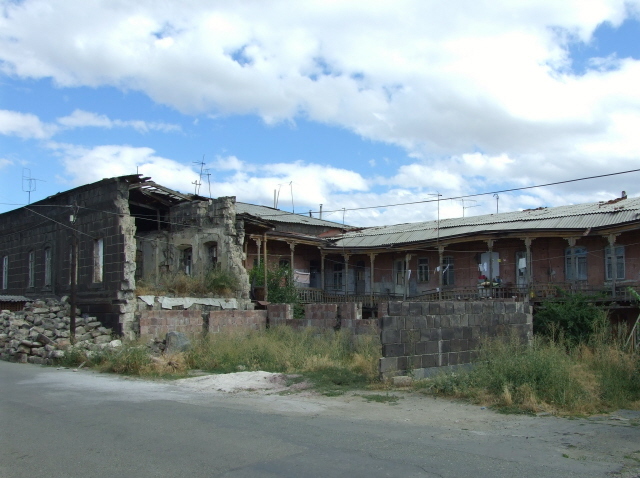 Combinations with other dark destinations: The earthquake that left so much damage in Gyumri had its epicentre near the town of Spitak – some 25 miles (40 km) east of Gyumri, and within fairly easy reach, transport-wise. A bit trickier to get to (basically you need a guide/driver – see here) are the Ani viewpoints and the nearby border fortifications which used to be part of the Iron Curtain of the Cold War era, and which are in fact still guarded by Russian border soldiers today, who keep a watch over NATO member Turkey on the other side. Gyumri is also well connected to Armenia's capital Yerevan, by the main train line, as well as faster and more frequent buses and marshrutkas. 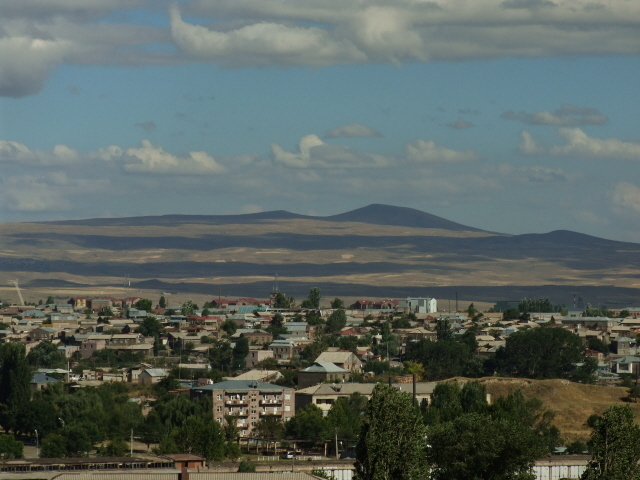 Combinations with non-dark destinations: The Shirak region that Gyumri is the regional capital of is the least visited in all of Armenia, but that's undeservedly so. It's not just of interest to dark tourists or off-the-beaten-trackers only. The Ani viewpoints alone should be on the radar especially of those many Armenian Diaspora visitors to the country but for some reason that's not so. 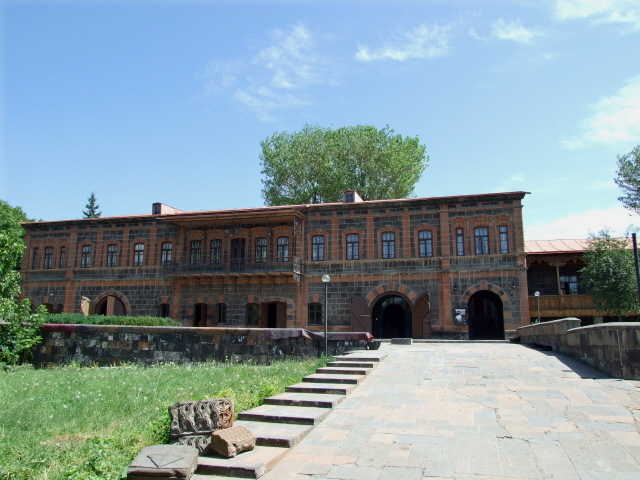 What most tourists are steered towards in the region if they come here at all is first and foremost the Marmashen monastery complex just to the north-west of Gyumri. 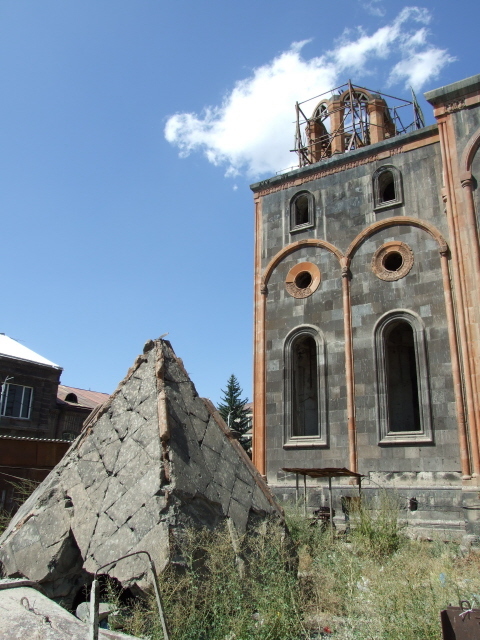 There are a few further items in Armenia's already densely packed church-and-monastery portfolio (see under Ani viewpoint). But what is generally undervalued is the nice scenery of the region, which deserves more attention, including splendid hills and waterfalls (see under Spitak) and in the far north-western-most corner of Armenia the area around remote Lake Arpi, which was declared a national park as recently as 2009. 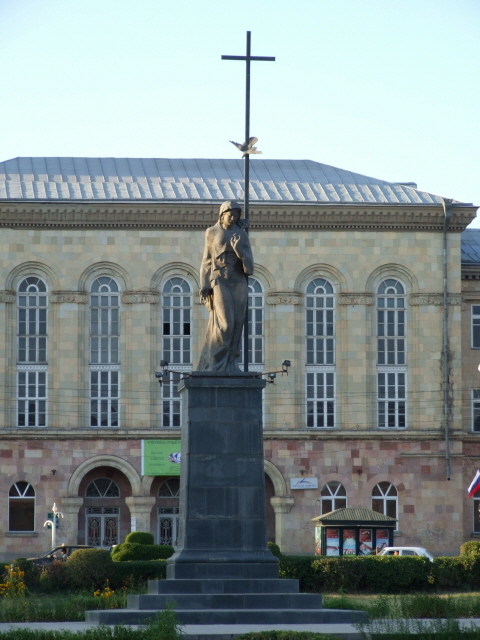 Gyumri can also be used as a gateway to an alternative route into Georgia using the border crossing point at Bavra, instead of Bagratashen on the much more popular and well-travelled route via the Debed Canyon, Alaverdi and Vanadzor.